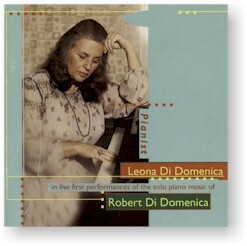 In what is surely a unique collaboration, the renowned composer’s wife, Leona Di Domenica, plays his major works for piano in live premiere performances dating from 1959-1978. Robert Di Domenica’s works flow out of a fundamental love for line, harmony and sonority, and showcase his comprehensive approach to 20th Century compositional technique. “In every way a remarkable record. Recorded on (I: #1-6) 20 November 1978 and (I: #7-11) 18 March 1975 at Jordan Hall at the New England Conservatory of Music in Boston, Massachusetts; (II: #1-7) on 19 December 1959 at the Donnell Library in New York City; and (II: #8-10) 12 December 1990 at Williams Hall at the New England Conservatory of Music in Boston, Massachusetts.